I really, really love the chickens!! Holy Cow! Three ENH-ish marriages are happening soon! Tad Drake and Mary Fehringer are tying the knot in October. Greetings from all of us at Exploring New Horizons! With the arrival of spring comes the migration of birds, butterflies, and whales along the Central Coast. Throw on top of that a great low tide on May 18th, and you have all the makings of A Family Tidepool Day. Read the article below to learn more about this new ENH event. Spring has also brought us another new board member, Edgar Lampkin, principal of Chualar Elementary. Edgar brings an incredible array of educational and fund raising experience and is excited about furthering our scholarship funds for economically disadvantaged students. Welcome Edgar! ** The Chez Panisse Foundation approved our grant of $5,000 toward the construction of a garden house, and the establishment of a "Garden to Kitchen" program. We are also finalizing a long-term lease with the Sempervirens Fund for the SVOS site. And so once again we send our heartfelt thanks to all the fine folks that lend their support to ENH. We are proud to announce a new event here at Exploring New Horizons: Family Tidepool Day on California's Central Coast at the Pigeon Point Lighthouse. We invite all students who have participated in our programs, donors who have supported our programs, and former staff and friends of ENH to come and bring any family members that might have a craving for the coast and a great day of tidepooling and whale watching. Miss seeing hermit crabs, sea stars, urchins and anemones? Longing for limpets, nudibranchs and maybe even octopi? With a negative 0.6 tide, we hope to see a wide variety of tidepool critters. Are you pining for a peek at a pelican, porpoise or California gray whale? Bring your binoculars, shades and sunscreen, because the lighthouse point offers one of the most spectacular locations for marine bird and mammal watching! Festivities begin at 10:30 AM when ENH naturalists will lead walks down to the tidepools just north of the lighthouse. Then it's back to the lighthouse fog signal building for lunch, followed by a slide show highlighting different elements of a child's experience in outdoor education a brief background about the lighthouse, and a history of ENH's three environmental education programs. In the afternoon, everyone is free to wander the grounds, head to the point for whale watching, or just visit with the naturalists, directors and board members of Exploring New Horizons Outdoor Schools. We are offering this event free of charge, so that all families can benefit from an educational day on the coast. With the assistance of the INNW Fund, ENH is completing it's first internal audit and has rewritten it's bylaws and articles of incorporation. One of the issues that came up in the bylaw review was whether we wanted to continue with a voting membership--a rather cumbersome thing that requires ENH to send out annual ballots to all teachers who have been bringing students to our program for 5 years or more and all employees that have been with us for over one year. With the advice of INNW consultants, our Board has decided to eliminate the voting membership, thus providing them with greater flexibility in building the Board and establishing a $1.5 million dollar endowment fund for economically disadvantaged students. To this end, we have mailed out copies of the proposed bylaw changes and ballots to all of our voting members. Our thanks go out again to INNW Fund for their wonderful assistance!
" If it were possible to weigh your contributions toward the rest of the planet, you would need an ocean to put it in first!" Since the first of the year a few items have been eliminated from our wish list! We received a donated office trailer when UCSC broke ground for a new engineering building. And this spring, one of our Board members donated a VW Jetta for our class visits. Thank you all so much! There are still a few items on our list. See any items that you might be able to help us acquire? Give a call! The program in Loma Mar is experiencing an exciting spring as we venture down the home stretch of another memorable year in the Pescadero Valley. Now in the 28th of our 32 weeks of school we are posed for yet another outstanding finish. This past weekend the staff rolled on down the coast to Malibu for the spring AEOE conference (Association of Environmental and Outdoor Education) to join 400 other educators from around California and beyond to share our passions for sharing the joys of nature with children. The highlight of the conference was the keynote speaker, childrens author Byrd Baylor, inspiring us all with her stories, smiles and grace. Interacting with her was reaffirming to the fact that she is the most often shared writer in our program. Our staff also joined up with the folks from SVOS to perform a skit/ song at the conference. And we won the honor for Best Skit Suited to the Theme, which was Coming to Our Senses. Next year we look forward joining up with San Mateo and San Joaquin County Outdoor Education programs as the Pescadero Valley outdoor education community hosts the state wide conference. 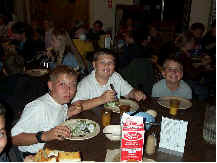 The happenings of the site are focusing on continuing to provide the best outdoor education experience possible. On site we are combining efforts with the YMCA of the East Bay to reaccredit Camp Loma Mar with the American Camping Association. This is a combination of checking the quality of the facilities, safety procedures, and expertise of the staff. 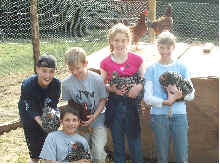 A couple of our staff members are working for the YMCA summer program as we continue to grow with them into the future. We are enthusiastic about the changes here at Loma Mar. Give us a call if you would like to stop by some time for a visit and see them yourself . And until the next issue of the Ink may each day be touched by the wonders of nature. 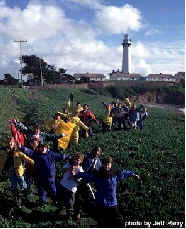 Pigeon Point Environmental Education Program is breaching into Spring! 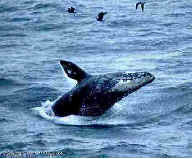 Whales are entertaining our groups with flukes, blows and breaches. This has been a magnificent season for wildlife displays. As you may remember in my last note, the Pigeon Point lighthouse was closed this winter after a piece of the exterior broke off. Now it looks like repairs will begin in the fall, and we hope to start doing tours again with our groups in spring. 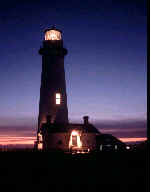 But despite the closing of the lighthouse, the Pigeon Point is still an amazing place. 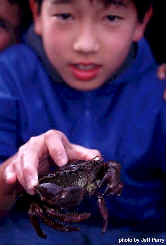 We are very excited about hosting the upcoming Family Tidepool Day here at Pigeon Point. For years students have spent many happy hours at the point as whales, dolphins, seals, otters, pelicans and gulls paraded by. Now the whole family can experience the magic of Pigeon Point on May 18th. We look forward to sharing this wonderful place with you, hope to see you there! Spring has sprung here atop our ridge in the Santa Cruz mountains. The rhododendron is a brilliant pink, the hummingbirds are doing their mating dance, the neighbors' peacocks wake us each morning with their alarm calls, we have 4 new baby chicks, and snakes have reappeared in the garden to help with our gopher situation! Upon our return from a beautiful (and victorious!) weekend in Malibu, we realized that our site had been blessed with many helping hands during our absence. The Sierra Club Singles group volunteered their time over the weekend to beautify our home. They graciously moved concrete, weeded and prepped beds in the garden, and lined our trails with redwood branches! Thank you, Sierra Singles! We are now in the final stages of our hiring process for Naturalist Staff next fall, and it has been an exciting experience to see the vast amount of qualified applicants interested in working with us. Now in our second spring season, the SVOS program is stronger than ever, thanks to a dedicated and talented staff. We look forward to many more successful seasons! We are currently working on our scholarship funding so that we can continue to serve low-income schools for years to come. I am happy to say that we have Highland School from Richmond here this week, and we are enjoying interacting with their students and teachers for a second year. Our goal is to establish an endowment fund, so that we will be able to offer funding to schools like Highland year after year. Please let us know if you have information on funding opportunities. Exciting things are happening this summer at the Sempervirens site in Boulder Creek! As our garden continues to grow, we are incorporating more and more fresh organic food into the meals. Thanks to The Chez Panisse Foundations generous grant, we are building a garden house. This space will allow the students to become completely involved in all the stages of serving garden fresh meals. After harvesting from the garden, the kids will have the space to prepare beautiful salads for dinner, complete with lettuce, radishes, carrots, beans and even edible flower petals. We are also looking forward to using this space as a greenhouse for winter growing and as a much needed haven from the rain.